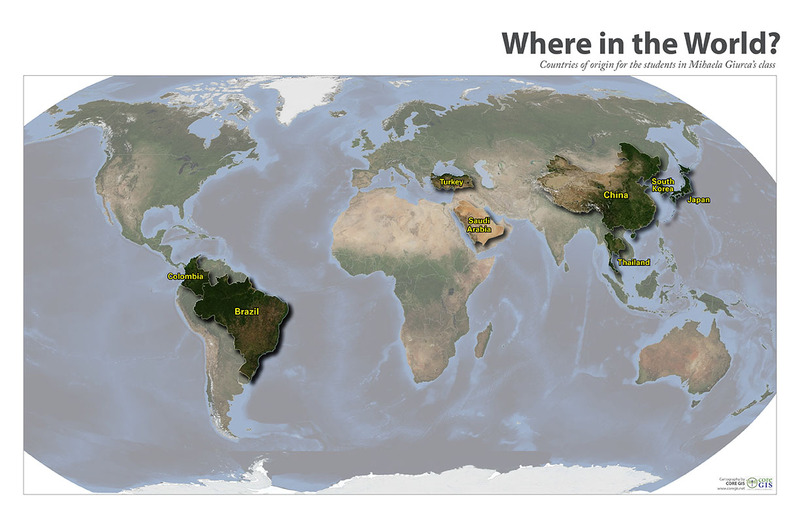 Here is the map I made of the countries of origin for the students I spoke to last Friday. 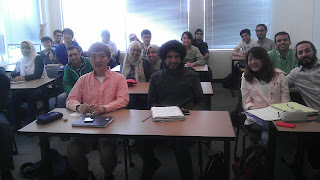 On Friday I gave a talk to my friend Mihaela's class (and her colleague's class) at the University of Washington. She teaches non-native English speakers, and towards the end of the course invites a variety of guest speakers to help her students build their comprehension of academic lectures. I talked about mapping, and gave an overview of the clients I work with, the types of projects I do, and where the data come from. They were attentive listeners and asked some great questions at the end. After the Q & A I offered to make a map showing all of the countries represented by the two classes in attendance. I'll post that here later this week when it is finished.